How Do I Stop Swaddling My Child? 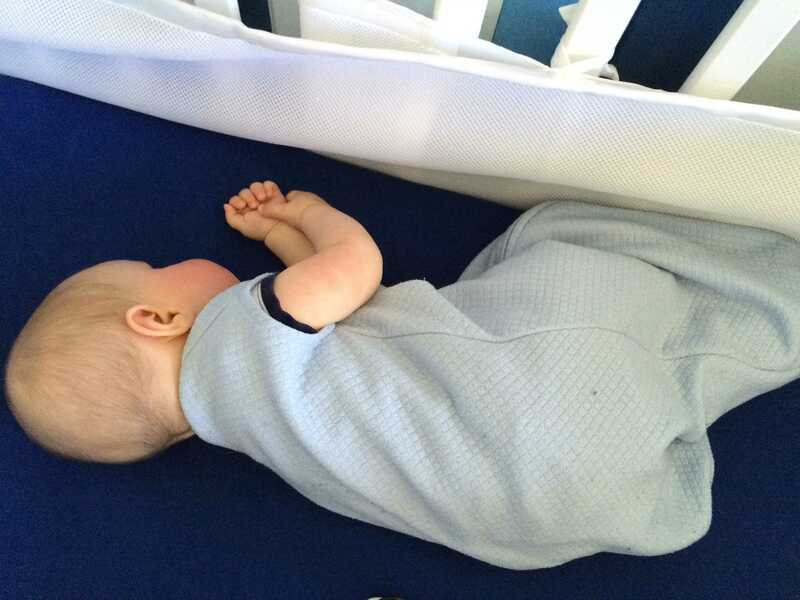 Home ➤ Recommendations ➤ Baby Stuff ➤ How Do I Stop Swaddling My Child? It’s no secret that I loved swaddling my baby from the time he was born. He slept well and didn’t startle himself awake. He was also born in the late fall, so the swaddling kept him snug and warm during the cold nights. Eventually, I knew that I would need to stop swaddling my son, but I found very little information about the process during my research. After a few months, my friends started posting pictures of their young babies sleeping with no swaddle. I continued to swaddle my son because that was our normal, and he still seemed to like it. I did start to wonder how and when I should stop swaddling him. After doing some research online, most people agreed that it was fine to continue swaddling him until he could roll from his back to his belly. Well, my son didn’t try very hard to make that happen. Before I knew it, he was six months old and still wanted a swaddle to fall asleep. I didn’t know what to do! He wasn’t sleeping as well anymore, but I wasn’t sure if that was due to the swaddle, teething, growth spurt, or who knows what else. When I tried to stop swaddling him cold turkey, it was a disaster. He wouldn’t sleep at all. Some friends told me they had a horrible experience transitioning away from the swaddle: they suffered the wrath of a sleepless baby for a week. After a week, though, most were swaddle-free. I didn’t want to take that route, so I just kept swaddling him. I looked for other ways to stop swaddling, but the only product out there was the Zipadee-Zip. I’m a cheapskate. I wasn’t willing to spend $46 on a product if I didn’t know it would work. Summer was quickly approaching and we don’t have air conditioning throughout the house. Looking at the material, I’m pretty sure my son would overheat in the Zipadee-Zip. Alas, no help. We planned a trip to see my family just before my son turned seven months old. I decided that I wouldn’t stop swaddling him on the trip so he would sleep better in an unfamiliar place. The internet agreed that making a big change before or during a trip away from home is a bad idea. He did pretty well with the swaddle and white noise through our Cloud Baby Monitor app, but teething did not help. Once we got back home and he was seven months old, I decided it was time to stop swaddling. He needed me to rock him to sleep more frequently, and he would cry as I was putting him in the swaddle. Surely, it was time to get rid of this thing. How did I stop swaddling my child? For a full week, I used the SwaddleMe with one arm out. I tried only doing this for a few days, but that was not enough time. Seven days seemed to be the magic number. After a week with one arm out, I used the swaddle around his chest for a couple days with both arms out. I was amazed! He started falling asleep more quickly and sleeping longer. Two days later, I switched to a wearable blanket and have not looked back. At this point, he puts himself to sleep in just a few minutes without crying and takes good naps. He’s free to sleep on his side or tummy, which he does most of the time. Now that the hot temperatures are officially here, I did invest the money in a muslin wearable blanket, which was $20 and will last us for many months to come. It is perfect to keep a light layer on him; it’s very thin and breathable. This isn’t a recommendation for a specific wearable blanket; the blanket linked here is just what we decided to try once he was out of the swaddle. We have noticed that the zipper is a little cheap and a seam is starting to fray. Ultimately, every child is different. I know every parent hates to hear that. Just tell me what to do and when to do it! There must be a magic manual guarded by elves somewhere, right? For us, time was what we needed. Don’t feel pressured to do something just because everyone else is doing it. Pay attention to the signs your baby gives you, and feel free to experiment. If it fails miserably, go back to what was working for you and give it more time. Let us know in the comments what you did to stop swaddling your baby. Maybe what you say will help for someone else! Laura is a work-at-home mom with a passion for children. She wants the best for her children -- which requires the best equipment -- so she came on board as our lifestyle and family editor with a focus on product reviews for new parents... you know, baby stuff. She's not as much "geek" as the rest of us, which makes her our voice of reason.